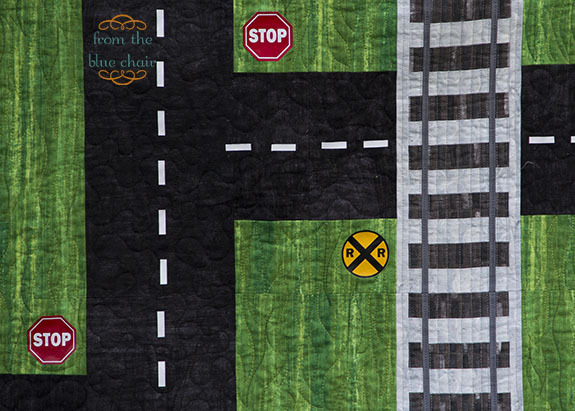 from the blue chair: Roadwork Quilt--Finished! All you need in life are Duplos and some toy cars...at least according to my four-year-old son. A couple months ago the hubs and I decided to get a king-size bed. The problem was we couldn't decide what to do with our old queen mattress set that was still in great condition. Our kids' bedrooms are small. There was no way it would fit in the room our girls share. If we were to put it in our son's room, it would take up most of the room and his play space. We finally decided to do that and get rid of his toddler bed. Then I started formulating an idea. I decided to make him a quilt that would create additional play space on top of his bed now that much of the floor space was gone. 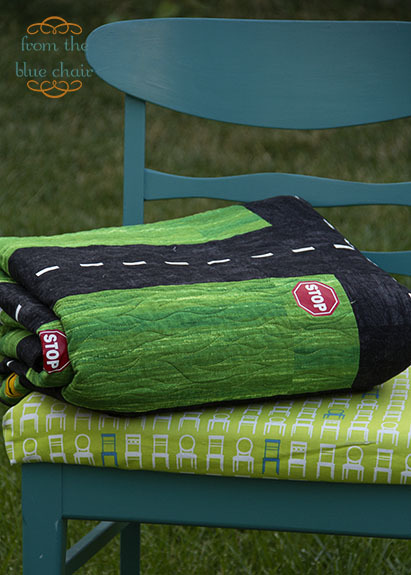 Pretty soon I was sketching and creating what is now the Roadwork Quilt. Although the overall idea of the quilt is juvenile, I didn't want the quilt to look cutesy. I wanted it to have a more realistic and mature look. 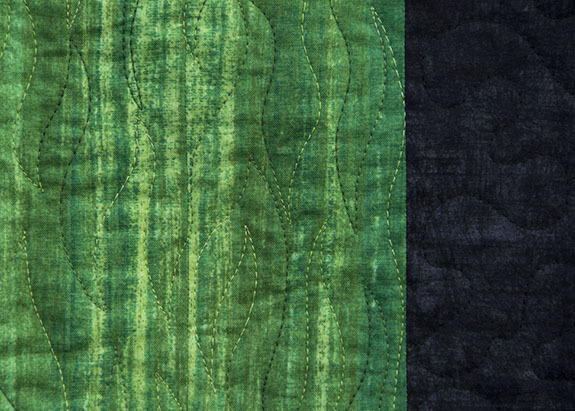 The majority of the fabrics are from Laura Gunn's fantastic fabric collection--Edges. The roads are made with fabric from a different line, only because her black from this line wasn't in stock. This quilt is seven blocks by eight blocks (12" finished) with the finished size at 84" x 96". I designed the quilt in Photoshop using five basic blocks. It makes me think of an old computer game I used to play called Pipedream. I wanted to keep the design very simple. At first I considered trying to piece houses and buildings, but decided to leave that part up to my little guy and let him build his city buildings with his Duplos. I just wanted to create a very basic map for him to play on. I also kept the embellishments very simple. The dashed lines are pieces I hand-cut from heat transfer vinyl (t-shirt vinyl) purchased from Expressions Vinyl. The signs were cut from the same material using my Silhouette machine with shapes purchased from their online shop. I had a lot of fun with the various signs. Again, keeping it simple, I only used about eight different signs that I scattered throughout the quilt. These signs are two or three layers of vinyl ironed on top of each other to create the sign. They essentially melt into each other as they fuse to the fabric. I debated quite a bit on the dashed lines. Technically they should be yellow considering these are two-lane roads, but I really liked the bright contrast from the white. I also debated doing some solid lines for no-passing zones, but in the end decided to keep it simple. 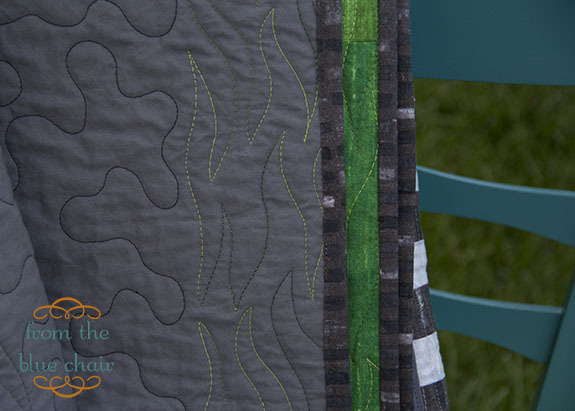 I wanted the quilting to be very minimal so that it didn't interfere at all with the design. I used a large stipple design on the roads. On the green background I used a variegated green thread and a wavy design to somewhat mimic grass. The back is a king size sheet. I have had tension problems when quilting with sheets in the past, but using a top-stitch needle while quilting makes a huge difference. I pushed myself this past weekend to finish this quilt and stayed up too late a couple nights. It makes me happy that my little guy loves it and was so excited when I finished his "roads". It's already been tested and approved. How cool is that! Great job!! This quilt is the cutest thing I've ever seen. Of course I have a 5 year old grandson who would LOVE a quilt like this.... You are so creative and such a great quilter!! This is a really great idea and you executed it so nicely too. I can see that he already loves it. 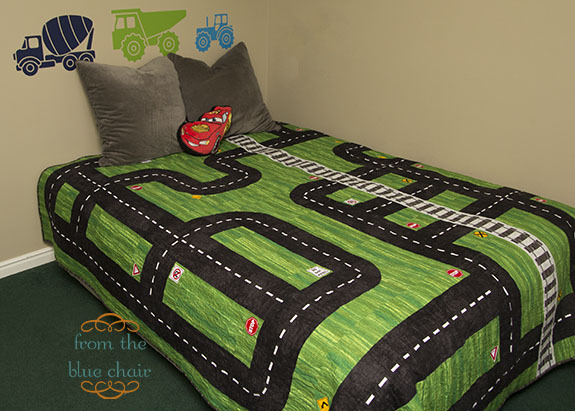 This is SO awesome, my little boy would love this too, but he would probably pull it off the bed and spread it out in the living room :) Great job! My 7 year old son would love a quilt like that. You did a wonderful job and I'm sure it will be loved for many years to come. Wonderful quilt. He will get a lot of use from that. Awesome ....but how are you going to get him to go to sleep at night? Move all his cars into the living room? Nooooooo, toys back in the main living space. Haha, great quilt. This is insane, you know that, right??? I can't imagine any little boy who wouldn't adore this quilt. Genius! 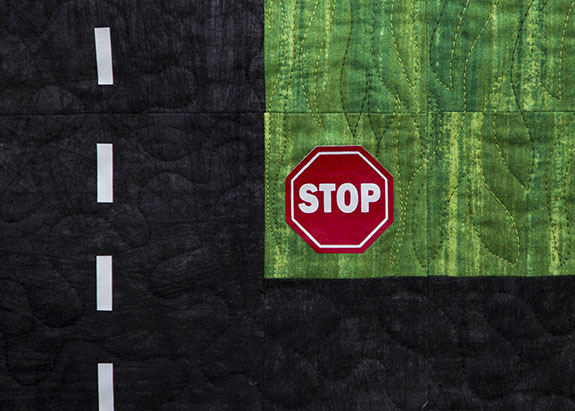 Love what you did with this quilt, Kati! Turned out fabulous, I'm glad he loves it! That is an awesome quilt. A dream quilt for boys.. and girls too. I love it Kati! You are so creative! Little guy will love it too. He's lucky to have a Mom who will make him such a cool quilt. The quilt is wonderful!! My boy would love it too. That's great! I loved Pipe Dreams too, but man, I hadn't thought of it in forever. This turned out great! 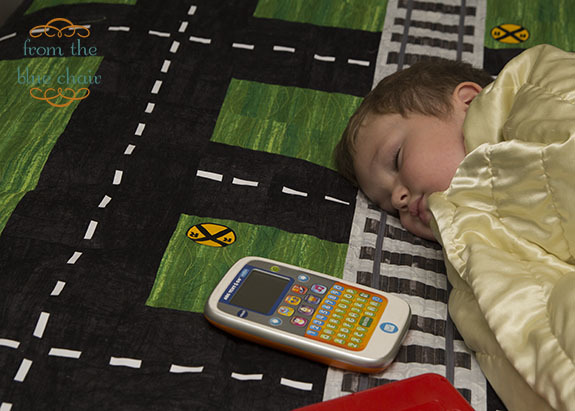 I've been meaning to make a car mat for my nephew but this one takes the cake! what a fantastic quilt. It's perfect for a little boy. Totally pipedream-esque! I love the addition of the train tracks too. Great idea for a quilt Kati! I agree with everyone else, this is great! I think staying simple was a good idea, it's great to leave things up to his imagination. The quilting looks really nice too! The variegated thread is a nice touch, and perfect with that fabric. Awesome! My boys would love that quilt! This is amazing! Such a great idea and so beautifully executed! This is incredible!! What a fabulous solution. What a wonderful gift of love for your son!!! this is so great Kati! I wanted to make something like this for Steiger, but didn't yet! Great job mama! You are an amazing artist, Kati! Well done! How did you make the train tracks? 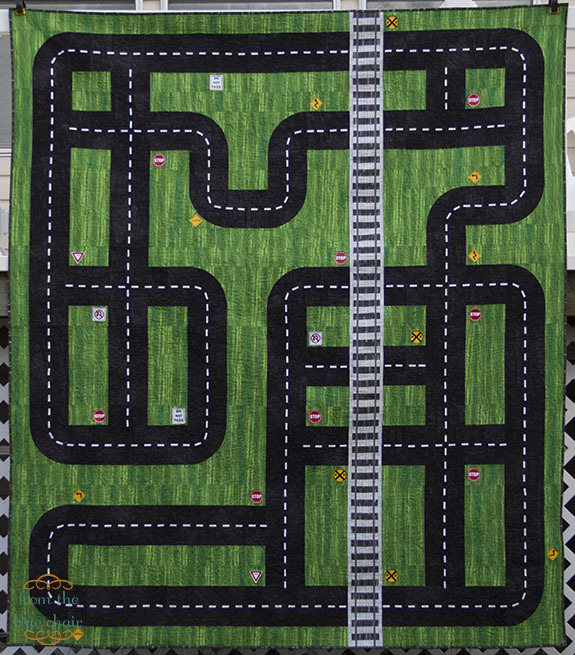 My husband wants me to make a table runner with train tracks on it for him to use with a board game we have. I have no idea where to start.